Apple have updated their music creation software. 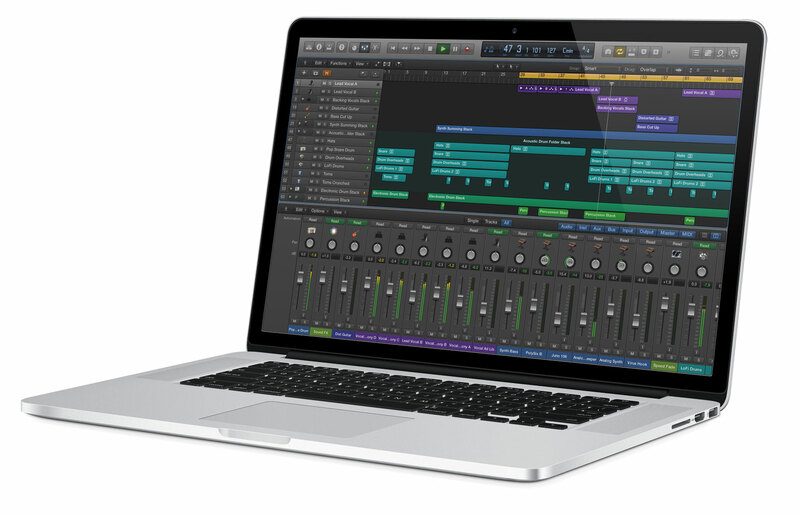 Today marks the launch of Logic Pro X. You can import Final Cut Pro X XML files into Logic Pro. Use of XML to import Final Cut Pro sequences into Logic Pro allows you to exchange multiple audio tracks, with all positional region information, region names, and volume and pan automation data retained. You can choose whether to keep the sample rates of the audio as they are in your Final Cut Pro project or have Logic Pro X convert them to a single sample rate. 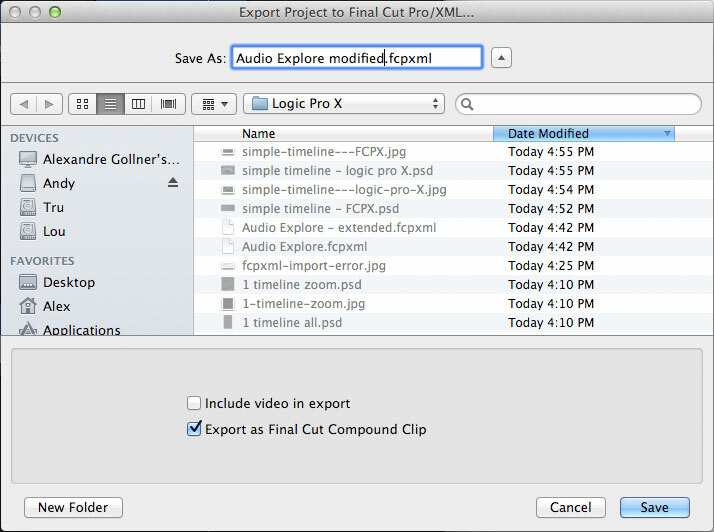 You can export Logic Pro X projects as Final Cut Pro X XML files for import into Final Cut. Software instrument tracks are always bounced to audio files. MIDI tracks are ignored. Bouncing will automatically switch to real-time mode, if necessary (such as when an I/O or External Instrument plug-in is used). You can also choose whether you include the video that’s in Logic Pro X in the XML file. 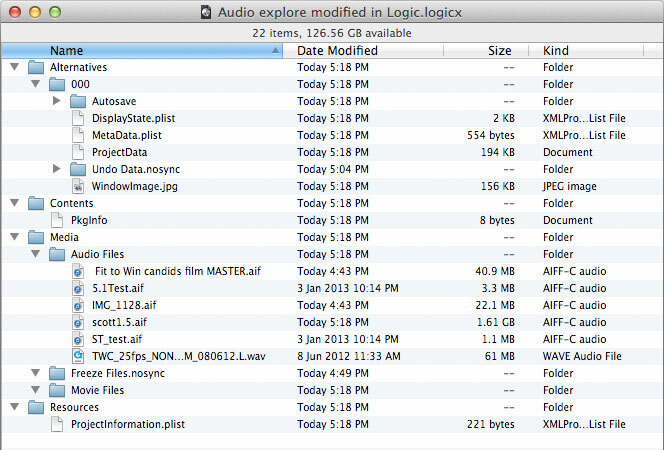 The Logic X project can also be exported so that it appears as a compound clip in an event as well as a Final Cut Pro X project. You can see Final Cut Pro X projects as movies in Logic Pro X’s media browser. Logic Pro documents will also appear in Final Cut Pro’s media browser so you can use them in Final Cut events and projects. Also announced today was Logic Remote, an application for multitouch control of Logic using an iPad. As well as the faders and mixing desk controls, Logic Remote can also assign any menu command to an on-iPad button. The current versions of Logic Pro X and Final Cut Pro X don’t recognise roles. The layer order in Final Cut Pro isn’t maintained in Logic. Here is the timeline after a few changes. I moved some clips and added fades to the start and finish of three of them. It appears as five monolithic AIFF files which all start at 0 connected to a gap clip, the sixth track is missing. 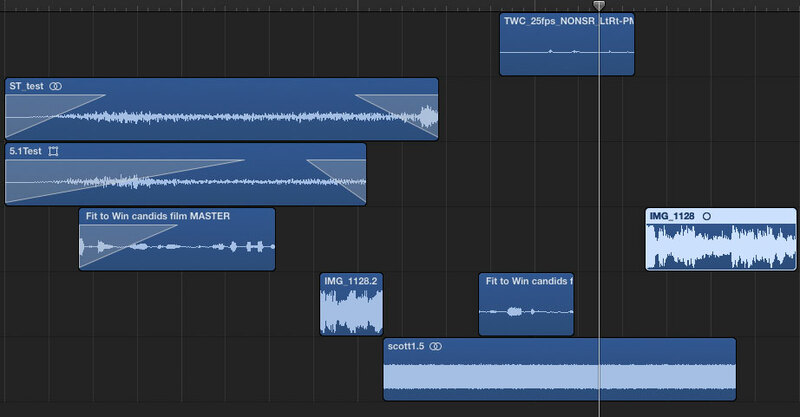 Some of the audio was copied directly from the Final Cut Pro event, some was generated from the video files, one (‘scott1.5.aif’) was generated at a different sample rate based on an audio file in the Final Cut event. excellent, I’m still super upset that Smart Sound REFUSES to support FCPX! I asked Sonicfire about FCPX support a while back (last year) and they said the issue is with FCPX plugin architecture. They didn’t expand on that though. 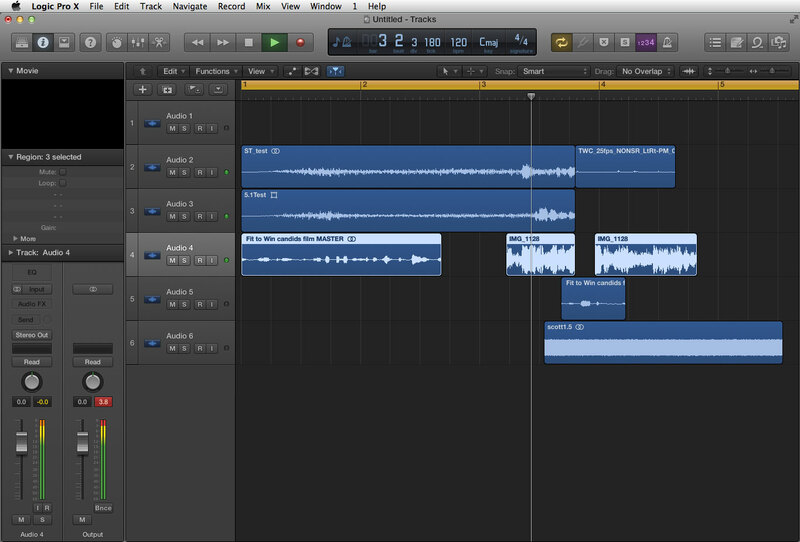 I don’t see how, with the above information, Logic Pro X can be considered an FCPX integrated audio app. along with being a great music production tool. Hoping Apple is working on something else, or else I’m going to have a long relationship with Adobe Audition. Not the worst thing in the world. I agree, and Apple isn’t selling Logic as being a Final Cut Pro X integrated audio application. that’s pretty lame, apple. The 6th track just – disappears? No order to the incoming audio tracks? They’ve had over a year to get these two programs to work with each other and this is the result? This was the main feature I wanted form this update. Now I’m much less enthusiastic about it. Flex pitch looks nice, but… wow – disappointing. Apple is not advertising Logic Pro X for sound editing and mixing for video/film, even the movie template which used to exist in Logic Pro 9 is gone. They seem to be targeting solely for the music production with this version of logic. Although it supports xml. The integration with FCPX would have been a very smart and expected move. And Apple is I believe a very smart company, even when it seems that they are wrong most of the time in the long run they turn out to be right. All this leads me to believe that Apple may reincarnate Soundtrack Pro or make a similar app, they may even launch a Color grading app (there’ve been rumours that that’s why Technicolor dropped the Color Assist). We’ll see! it didn’t change anything from rendering a movie clip with “omf” and then opening logic to do the STAND ALONE work and then bouncing it to go back again to final cut! Ridiculous !!! this ain’t much of a R-evolution….!!! it just made the workflow slower…. When they release a “Realtime Integration” (like the “REWIRE” for audio softwares -only-) they can call it then something new and interesting….